Brigette has found a new addiction: http://www.galaxyzoo.com/. An entry on one of our favorite websites — the Astronomy Picture of the day — and a related article about a Dutch schoolteacher who found a mysterious object while participating as an amateur astronomer in the Galaxy Zoo project led us to Galaxy Zoo’s website. 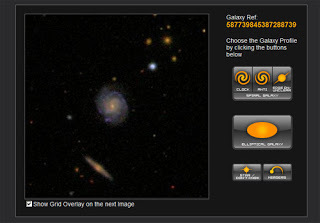 Galaxy Zoo gives all us geeky armchair astronomers the opportunity to help classify galaxies. To participate, a person registers as a volunteer with the site and takes a tutorial and brief test to make sure he or she can pick out different types of galaxies (spiral, elliptical, merging), as well as distinguish between galaxies and stars/unknown objects. Once the person gets through that part, the galaxy analysis begins. An image of one of millions of galaxies (digitally photographed by the Sloan Digital Sky Survey at the Apache Point Observatory in New Mexico) pops up on the screen, the volunteer makes a choice between different options of galaxies, and then that person’s answer is compared with the other volunteers to come to a consensus based on human observation. The fascinating night sky gets much more fascinating when you go through photos of hundreds of galaxies, knowing there are millions and millions more out there. Speaking of the night sky, we’re hoping for clear starry skies for the Perseid Meteor Shower. The best day for viewing will be August 12. Check last year’s blog entry on the 2007 Perseid Meteor Shower for more details about the meteor shower. This entry was posted in Uncategorized and tagged stargazing, Summer by Inn on Mill Creek. Bookmark the permalink. Ooh good website, Mike will appreciate this one, he is definitely an astronomy geek.